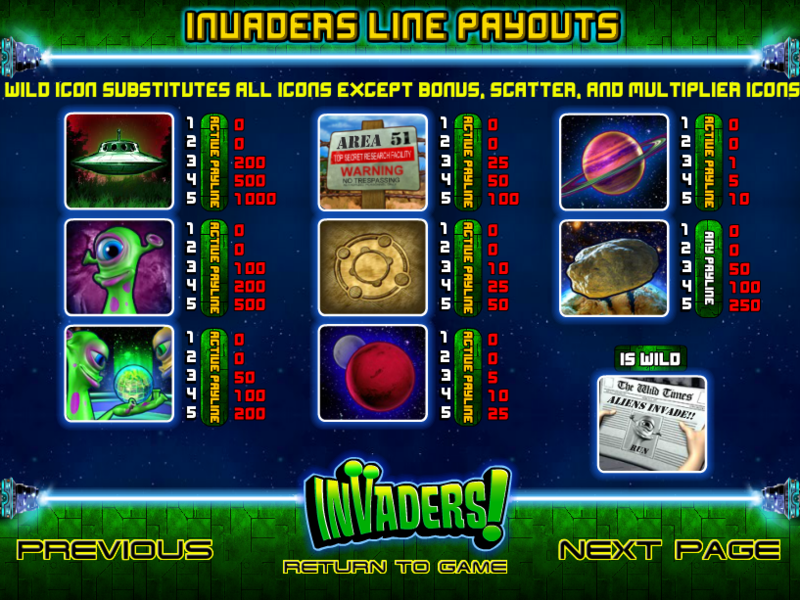 According to this online slot from Betsoft Gaming, you are the only person who can successfully thwart this influx of aliens bent on stealing gold from unsuspecting householders. It’s called Invaders! and we’re happy to take on the challenge of protecting the earth and trying to win a bit of cash at the same time. Invaders! is a five reel slot with three rows and up to twenty paylines; those reels spin inside beams of light inside the alien spacecraft and in the background we can see the vast star-filled vista of space. The sound effects comprise a constant buzzing noise with plenty of bleeping when the reels start spinning. The symbols are all related to the theme and include the alien spaceship, an Area 51 sign, a ringed planet, an alien, a crop circle, an alien with a green, glowing ball and a red planet. The wild is a newspaper with an ‘Aliens Invade’ headline and there are two bonus symbols – the ‘Initiate’ console and the house plus the meteor scatter symbol. 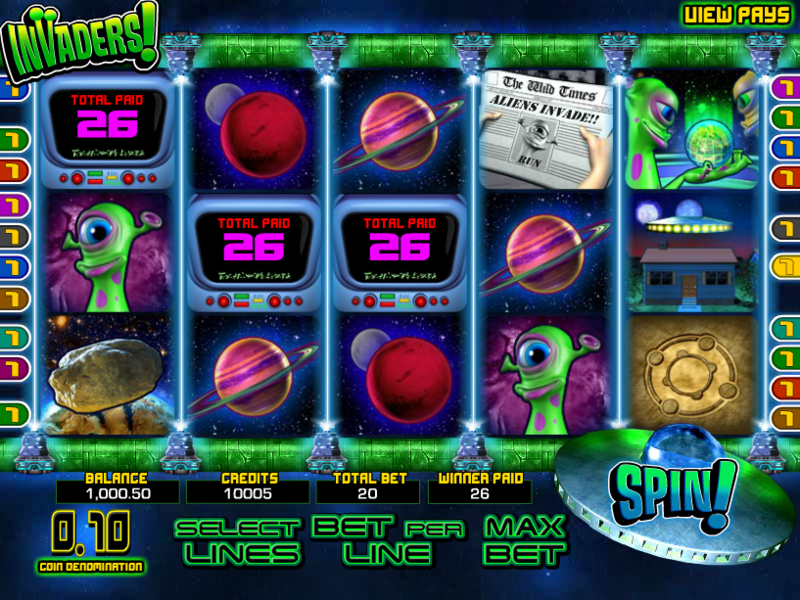 This is triggered by landing three or more of the Initiate symbols on an active payline; an alien finger will press each one which will reveal a multiplier (or nothing); the sum of these multipliers (a maximum of 50x) is applied to your line bet and awarded. Trigger this by landing three of the house scatter symbols in any position; you will now be transported to a second screen displaying three houses. All you have to do is click on each house in turn to steal their gold before heading back to the base game. Invaders! is one of the better quality of Betsoft’s older games and consequently it’s still worth checking out if you’d like to root through the back catalogue.